More than 50,000 home care workers are united in SEIU Healthcare Illinois & Indiana. Every day, we provide essential care that helps keep tens of thousands of seniors and people with disabilities healthy and in their homes and communities. SEIU Healthcare members work as Personal Assistants in the Illinois Department of Human Services/Office of Rehabilitation Services, and as home care aides at agencies across Illinois, Indiana and Missouri. Since 1983—when home care was a minimum-wage job, with no benefits–home care workers have fought for and won living wages and healthcare for home care workers, protected quality home care for seniors and people with disabilities from state budget cuts, and to expand home care to more consumers. Every day, more home health aides in Indiana, Illinois and Missouri are joining the growing movement of caregivers for quality home care for all consumers, and living wages, healthcare and respect for the home care workforce. BREAKING NEWS: Victory for PAs! 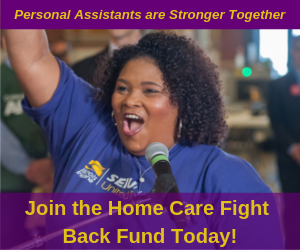 Raises & Back Pay for Personal Assistants: We Aren’t Backing Down! Year Beginning Membership Meetings are Around the Corner!